This massive painting was my favorite artwork! It has such a fascinating story behind it. The day consisted of gorgeous artwork, an early anniversary present and tired feet. Love the pictures! Will you tell us what was your present? This is taking me back to my art history classes in college…I always wished I could see some of them in person! Someday hopefully. Aaaand the suspense is killing me…I want to know what you got at Chanel!!!! Love that jacket! Looks like you got to see some pretty amazing art while you were there! Looking forward to seeing what was in the Chanel bag! LOL!! 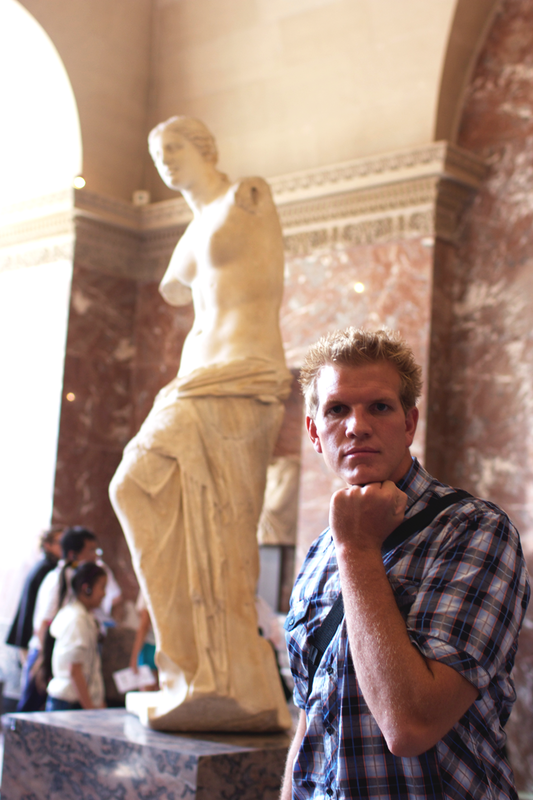 That was my husband’s favorite in the Louvre too! We had to stare at it for a good long while. wow this is a great look rachel, love the leggings and the shoes! You look beautiful and you have adorable smile! When do we get to see what’s INSIDE that Chanel bag???? I am loving the layers! You look beautiful! Such amazing artwork, glad you had a fabulous time. CHANEL?! I die. You look lovely! Love your outfit! And love your pictures. That painting is also one of my favourites! what did you get! So exciting. Wow, you look amazing in this outfit! Beautiful! What was the present?? Must have been incredible! love what you’re wearing! Can’t wait to see what you got from Chanel!! I love how you style those leggings- I seriously need some, I get such good outfit ideas when you wear them! Gorgeous outfit and what a lucky lady. Chanel!!! Enjoy. Love your pictures of your trip to France. I actually dream’t I was in Paris last night. Sigh!!! A girl can dream. I have high hopes for our 10 yr anniversary, only 3 years away. Enjoy your Chanel purchase. These travel posts are quite addicting! Beautiful scenes, amazing style and much curiosity over what’s in the Chanel bag! Absolutely love your outfit and your “Chanel” bag. LOve your pictures of your trip to Paris. Someday I hope to visit, maybe for my 10 yr wedding anniversary. I’ll just continue to live vicariously through your pictures. que guapa, elegante e impresionante estas! besos! The Crowning of Napoleon is my FAVORITE painting of all time! I wrote my Art History paper all about it! Love!! 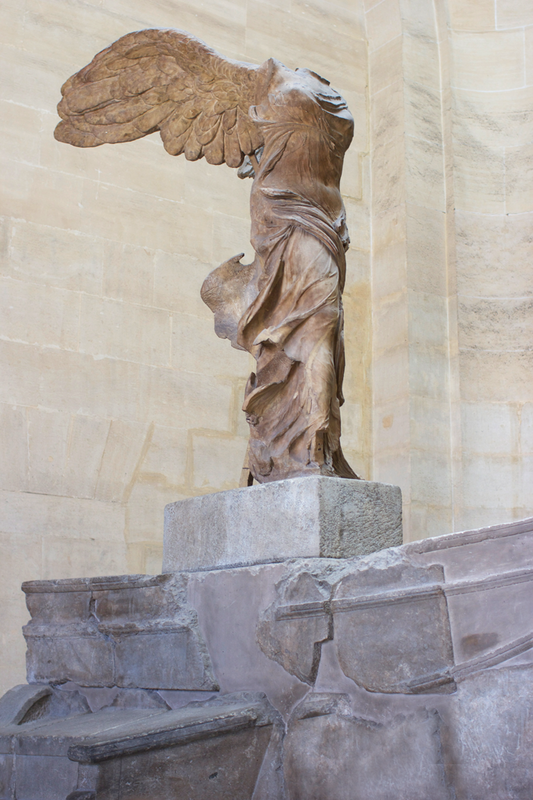 I also love Winged Victory. That statue at the top of the staircase in the Lourve, took my breath away and almost made me cry… So jealous of your trip, I can’t wait to go back to Paris! I can’t stand it…what was inside the Chanel bag???? Beautiful photographs. They remind me of my honeymoon in Paris. All your pictures of Europe are gorgeous, and I love how you stayed chic even sight seeing! Loving the jacket/vest combination…fabulous styling! Now, can you please share what is in the Chanel bag?! I love your outfit! And a present from Chanel, sigh…so lucky! 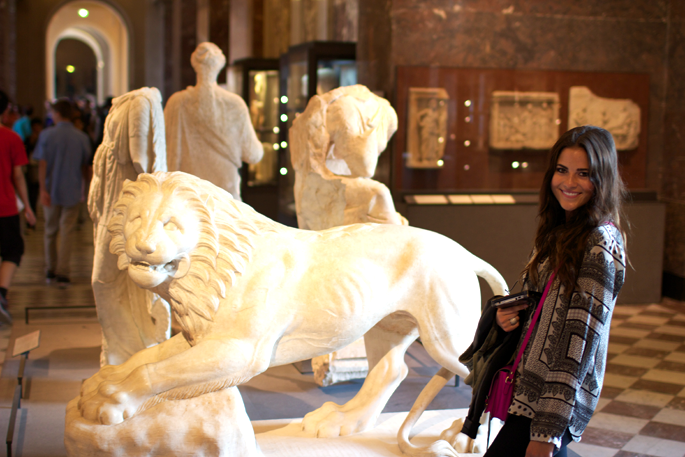 The Louvre was one of my favorites–your photos from the day are great! Love all your outfits from your travels! So chic and classy. Do you happen to know if the printed zara top in this color scheme or the blue and green is available anywhere? I saw it in the stores and delayed in getting it – regrettably. All your outfits have been gorgeous! So chic and classy. Do you happen to know if the printed top in zara in this colorsscheme or the blue and green is available anywhere? I saw it in the stores and delayed getting… regrettably. I love everything about your style! This look is a perfect mix of casual and chic. I really like the printed top and the mix material jacket with the leather-ish sleeve!! Ah love the chanel bag :) you got a keeper for sure! Happy anniversary! I love this layered look. I would have never put those together! That Coronation painting is one of my favourites!! I like that you layered the vest over the jacket and the print on the top is very cool. Love the look! I’m kicking myself for not getting that Zara blouse:( Can’t wait to see what you got at Chanel!! Just found your blog…loving this outfit!!! Can’t wait to see what prize you got from Chanel!!! Amazing outfit ! 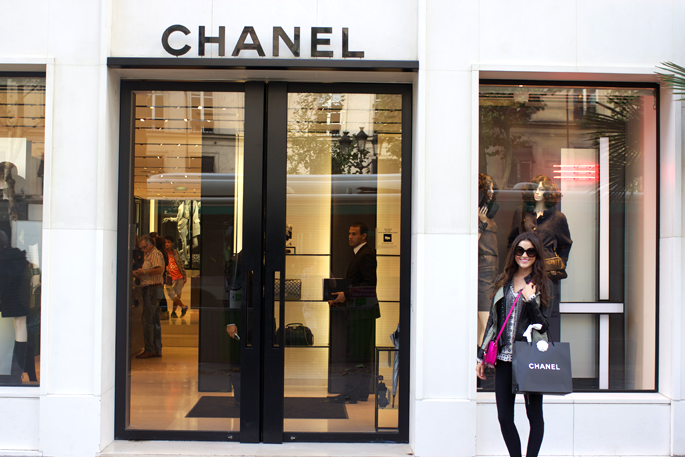 but I want to know what’s in that chanel bag ! you look great and the pictures are amazing! love your whole outfit!! the steve madden bag is so gorgeous!! Love your outfit so much! The vest was such a perfect addition. 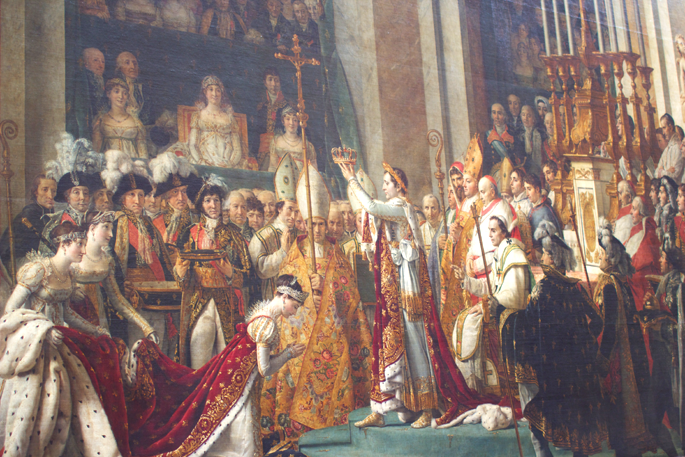 The Coronation of Napoleon is one of my favorites too :) It’s really fun to see my name in history! #3- I love the whole outfit! in summary, this is a great post! ahhh can’t wait to see what you got from chanel!!! Great outfit, the layering is great. Can’t wait to see what’s inside that Chanel bag! Your outfit is sooo chic and stylish!!!! LOVE your blog!! Fabulous! Paris is one of my favorite cities in the world, I love seeing all your pictures from your visit. Looking forward to seeing what’s in the Chanel bag. Adore your style and your blog! Loving all the paris photos! We leave for Paris in 10 days. Your photos are making me look forward to it even more! What was in the chanel bag?! Wow lovely looking of this post thanks for share on this blog. When it comes to choosing the cheap hermes handbags , there are a few things to consider. First of all, deciding when you will be wearing your cheap louis vuitton handbags is the most crucial thing to consider when selecting the ideal omega speedmaster watches for yourself. If you are planning to only wear your new timepiece on an evening then it is perfectly fine to purchase an cheap rolex watches full of glitz and glamour. However, if you have a hands-on job which requires you getting dirty, you need to make sure that you choose a rolex datejust watches that is tough and durable.